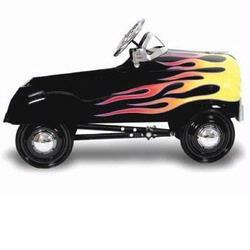 The InSTEP PC600 Hot Rod pedal car is constructed of durable steel for rugged use, Features red flame graphics features adjustable pedals, rubber tires, true working chrome bell, functional steering and steel wheels. Chrome hub caps and sleek graphics. Comfortable children?s seat. Lead-free paint. Meets all ASTM safety standards. Solid steel construction - Provides outstanding durability. Authentic detailing - Brings back memories of old times. Fits a wide size range of children. Lead-free paint - For a safe and attractive finish. Functional steering - Provides true performance and easy use. Rubber tires and chrome hub caps - Finishes a great custom look.